The past few months I’ve been reading and editing submissions (now closed) for the female vampire anthology, Fem Fangs, which I’m Co-Editor. Fem Fangs will be released late September of this year. My original plan after finishing up the the hard copy edits for the Fem Fangs antho was to begin writing some short stories for a still unannounced project (which I should be able to officially annouce within the next week…) that will be coming out late 2011/early 2012. Although, the owner at Pill Hill Press came to me and made me an offer I couldn’t refuse – to be the sole Editor on an anthology she’s soon opening up to submissions (actually it’ll be more of a roll-over type of thing). 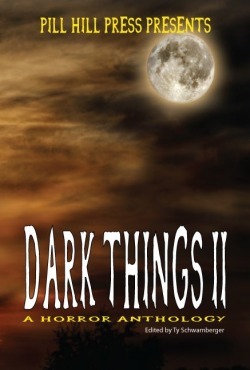 In any event, starting early/mid-September, I will begin reading submissions for Dark Things II. At this point I’m guessing a tentative release date of early 2011. To read the Call for Submissions for Dark Things click here. The owner at Pill Hill would like this to be an ongoing series and I’m very excited to be part of the second book. So, go read the Call for Submissions, and think about writing something for either volume I or II. Should be a scary good time. Update (8/24/10): Submissions are now open. Click HERE to read about Dark Things II and how to submit.